DISCLOSURE: This post is brought to you by Safeway. However, all opinions and the meal I created are of my own choosing! 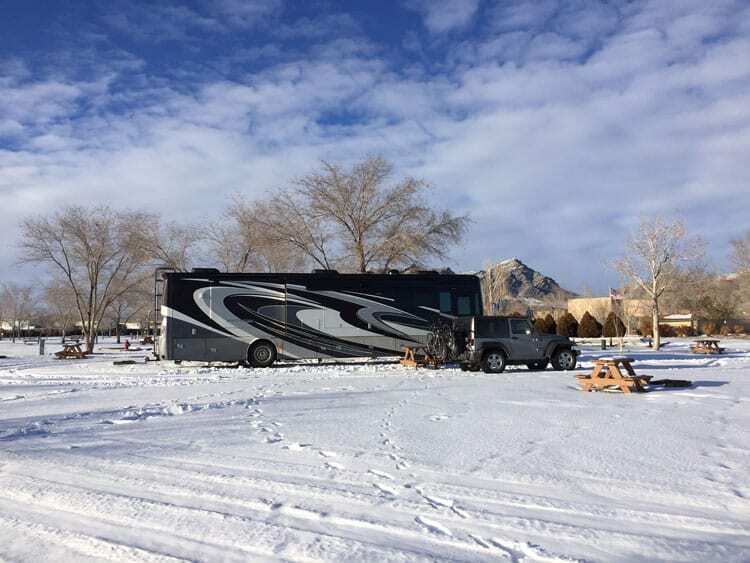 My nerves are still shot from our epic snow-laden trip in the RV. And since we’ve arrived in Portland, it’s been nothing but rain and freezing temperatures. Freezing in the RV at -7 degrees! That means one thing to me. We don’t eat too much pasta, we’re more rice eaters, but from time to time, especially when it’s cold, I love a big bowl of the stuff! Most of the time we do pasta with good French butter and soy sauce. That’s it. Nothing else, maybe a little bit of black pepper. It’s a crazy umami thing I discovered and love. Don’t believe me? This NY Times article will change your mind. Noodles with soy sauce and butter, a little like hibachi noodles. Photo credit: The Cooking Jar. But my absolute favorite way to eat pasta is with a thick meaty red sauce. We don’t eat a lot of meat either, so when we do, I want the good stuff. We only buy organic and I’d rather have lamb than beef. Last month when we were staying near Zion National Park, it got really cold. Not minus-seven-your-pipes-are-going-to-freeze cold, but cold enough that I started craving that pasta. I wanted lamb. We went to two grocery stores searching for it but came home with organic ground turkey. It doesn’t have the depth of lamb so while the meal was enjoyable, it didn’t quite hit the mark. As Valentine’s Day is at our doorstep and the weather continues to be chilly, I’ve decided to try again. I love to support local restaurants, and I can’t wait to get out there and support Portland’s amazing food scene, but one thing years of foodie experience has taught me is that I never want to be in a restaurant on a holiday, especially Valentine’s Day! I’d rather be at home in a stress-free environment with good food made from great ingredients…and that isn’t just the introvert in me talking! Crowded restaurant? Stay home and make a simple and delicious meal with your honey! We’re still getting our bearings in the new neighborhood: where to get coffee, find wifi and shop for groceries. I popped into our local Safeway and was pleased to discover that they had exactly what I needed in the meat department, fresh organic ground lamb. I usually seek out the O Organics® line of products, I’ve got plenty of their spices in my cabinet and their milk meets my standards for tasty dairy. I’m kind of picky when it comes to milk and eggs. I’d never had the Open Nature® brand, so I picked up a couple of packages of their ground lamb to try out. Open Nature® is only sold at Safeway, I like it when brands do that. It shows they take care when curating their product portfolio. In this case, the lamb is grass fed and free range with zero antibiotics, hormones, or preservatives. Happy lamb makes for tasty lamb. That’s something I learned while living in France. You can taste the happiness of animals in the end product – eggs, dairy, poultry, etc. Trust me, it’s true! While shopping I also grabbed dried pasta (I like fettuccine over spaghetti, although my favorite is bucatini), fresh herbs, tomato sauce and paste as well as garlic – all the makings for a big bowl of comfort! I got lucky. My Valentine a.k.a. Mr. Misadventures made a big batch of Italian white beans for us to nibble on during the week. He makes it au naturel with just chicken broth and herbs and then makes a great tomato sauce on the side. I like to add a big scoop of red sauce to my bowl of beans, but the hubby doesn’t always like do that. So why does that make me lucky? A third of my Valentine’s dinner was already created for me! Making the lamb mixture for the sauce. All I had to do was to sauté the lamb with herbs, add it to the sauce my hubby made, boil the pasta and voilà! I warm comforting bowl of pasta for dinner. In the RV kitchen we go for simplicity. Use as few pots and pans as possible, prepare nothing that requires an oven, and avoid making things that require too many steps. But that doesn’t mean we skimp on flavor or ingredients. In fact, the best meals are those made with the simplest ingredients that you don’t mess around too much with. It’s the cornerstone of Italian cooking, something we discussed at length with our food tour guide in Florence. Less time at the stove or the sink means more time cuddled up with my honey. And who could ask for more for Valentine’s Day??!! That big bowl of fettuccine with the (organic) lamb red sauce was just what the heart desired. Add a nice glass of wine and nothing could be better. And don’t mind our RV wine “glasses,” that’s how we roll! If I wanted to make our dinner ambiance a little better, I could add a beautiful flower or table arrangement from the debi lilly design™ collection (which they carry at Safeway). After all, red is my favorite color! How about you? Do you have a special meal planned for Valentine’s Day? Forgive me, I am not a recipe blogger, here’s my best effort to write out what we did! > Add the mixture to the red sauce and simmer for an hour. Now you are ready to make the pasta. When we don’t have fresh we use Barilla. Once your pasta is ready, place it in a serving bowl, add the sauce on top and if you want a little French flair, don’t forget a little pat of butter! Oh, this looks so very delicious! I love lamb so much and really prefer a nice simple sauce as well. I am also really intrigued by what you said about your favorite pasta dish being good french butter and soy sauce. I have got to try this now! @Julie, I was really surprised by this lamb, my hubby and I kept putting our nose over the saute pan and smelling, the scent was so rich and gamey (in a good lamb way). We are going to take the second package I bought and add it to those beans with carrots to make a nice soup/stew! It looks so good and it’s definitely perfect for Valentine’s! There’s nothing better than red sauce on your favorite type of pasta. I love that it looks so tasty and fresh too. This looks so incredible! I absolutely love pasta and living in northern Michigan, I crave a nice hot bowl of pasta a lot in the winter time. I will have to try the Open Nature ground lamb. Sounds good! Such a nice Valentine’s Day dinner! I am happy that you found the ingredients that you needed to make the dish you were really wanting. I love you wine glasses :). I hope you are able to figure out the things you need to in order to enjoy where you are for now. Thank you for sharing your recipe. Happy Valentine’s Day. @Becky, so sweet of you to wish me a Happy Val Day! It turned out great and my hubby and I are going to do another dinner with the second packet of ground lamb we got! Oh this looks so yummy! Im sure my husband will love this! Thanks for sharing. @Chei, I hope you get to try it out on him! wow it looks so delicious! im sure you had a great valentines day! This comfort food on steroids. I love lamb, but I rarely make it. This recipe has inspired me to pick some up and whip up some pasta. @Cindy, you should definitely do that, it is so warm and comforting! Looks yummy! Now you just have to mix your sauce into the pasta like the Italians do. 😉 I haven’t had lamb in so long. Hopefully my comment doesn’t get spammed for this, but I’m reminded of a recipe my husband and I both loved: http://www.nutmegnanny.com/2015/01/19/moroccan-lamb-couscous/#_a5y_p=3208050 I’m a huge fan of couscous though. Even though it’s technically a pasta, it has a mouthfeel similar to a fluffy rice. Yum yum. It’s difficult to find ground lamb around here, though! @Katie, it was great the first night and as leftovers the second! This lamb is the bomb! Last night we took the rest of the white beans we froze, added carrots and the sauteed lamb and wow was it good, that will be dinner tonight. We are going back to Safeway to buy more packs for the freezer. I’ve never tasted ground lamb this good. Do you have a Safeway near you? If yes, go check it out and see if they have it. @Katie, okay so next time you head to DC by car, bring a cooler and bring some home with ice! You’ll love it. Valentines day was so special this year for us and I do always love preparing something at home rather than having to wait in a crowded restaurant. The recipe looks absolutely delicious and I am sure your have done a great job! @Lisa, what did you cook? This looks so yummy. I have never had lamb, but I would like to try it. We had dinner at home this year and watched a movie. @Catherine, if you ever get the opportunity to try lamb, you should! Night at home sounds great! @Catherine, if you don’t get the opportunity to try lamb, definitely go for it, it is so delicious! Nothing silly bout simple, one of our favorite ways to enjoy pasta is with butter, salt and pepper. Fettuccine is one of our favorite types of noodle. @Val, we like it that way too! But it’s got to be good butter! Pasta is definitely one of my weaknesses. I love it. You’ve actually given me an idea for dinner tonight. It’s cold and rainy in L.A. and pasta will be the perfect comfort food! @Camesha, Oh so glad, I how it warms your soul! @GingerMommy, it is quite delicious! Yum! I’ve never actually cooked with lamb before, but this looks pretty great! Maybe I’d try it out with ground turkey! @Divya, I have done it many times with ground turkey and it tastes good, but I love it with the lamb! This dish looks delicious. I’m a huge fan of pasta and I imagine that the flavors in this dish are amazing. @Maria, I agree, I love pasta! This looks like such a yummy recipe! I’m sure it would be a crowd hit. That sounds amazing and shockingly not too challenging to prepare. My parents love lamb but rarely buy it. I’ll have to surprise them with this dish next time they’re over. @Crystal, oh, they’d love it! And it was easy, I’m no chef! @Melanie, it is pretty quick to make! It sounds so delicious! Thank you for the recipe , yum! I’m definately adding this to my recipes! This looks delicious, I will have to make them, thanks. This looks like a very delicious Valentines Day meal. I hope you had a wonderful Valentines Day. i Don’t eat lamb very often, but this looks delicious. Thanks for the recipe i’m certainly looking forward t trying this dish! This sound really good. There’s something to be said for simple fresh ingredients.